Telling the difference, as a consumer, between these two entities can at times be extremely difficult. Often an illegal pyramid scheme will be like a wolf in sheep’s clothing and sucker many a good shepherd unwittingly into its trap. On the other hand, it is estimated that over 10 million Americans make an income from a legitimate business opportunity. In 1988 the United States Department of Commerce estimated that independent salesmen and saleswomen contributed over $9 billion to the economy of this country, and the numbers have steadily risen since than. By the same token, consumers lost untold millions of dollars at the same time in illegal schemes. The moral of this story is be careful, but do not be afraid. Learn to tell the difference between a scam and a good business opportunity; avoid the former and embrace the latter. The reason this type of program is illegal should be obvious to all; by the very nature of its plan it must fail, it provides no marketable product or service and no function other than to bring in other people at the bottom. Without new people throwing their money in an illegal pyramid would fail. As the supply of people dwindles, the people at the lower levels of the pyramid who have invested their money are left holding the bag. An empty bag at that! The Direct Selling Education Foundation in Washington D.C. in cooperation with the National District Attorneys Association Economic Crime Project, in 1991 put together a very handy little pamphlet entitled Pyramid Schemes: Not What They Seem. This pamphlet provides the best definition that I have seen for distinguishing legitimate business opportunities in multi-level marketing and illegal pyramid schemes. The pamphlet defines and describes multi-level marketing as “a popular way of retailing in which consumer products are sold, not in stores by sales clerks, but by independent businessmen and women (distributors), usually in customer’s homes. As a distributor you can set your own hours and earn money by selling consumer products supplied by an established Company. In a multi-level structure you can also build and manage your own salesforce by recruiting, motivating, supplying and training others to sell those products. Your compensation then includes a percentage of the sales of your entire sales group as well as earning on your own sales to retail customers. ”To distinguish; an illegal pyramid scheme which is disguised as a multi-level company may possess similar characteristics, however, there never is much effort put into the actual marketing of the products. All or most of the money is made in the recruitment of new distributors, and new distributors are encouraged to purchase large quantities of inventory. Typically, the product purchased has little or no value, or is extremely overpriced. Many times the product itself is a fraud, such as numerous miracle cures, lotions and ointments; products that without the pyramid aspects of the company would truly serve no legitimate market, and these products generally find themselves in a garage somewhere with no actual use other than frontloading3 individuals for financial gain at the top of the pyramid. 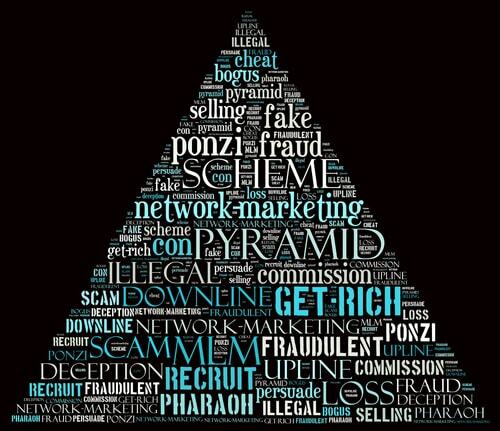 [Illustration 3] Pyramid scheme promoters are good! They know how to get you excited and make you think that if you do not act today the deal will be gone tomorrow. They know how to convince you to put up big bucks to make your fortune quick. Be careful, be very careful. It may not be easy to differentiate a legitimate company from an illegal scam. The Federal Trade Commission suggests seven (7) tips to consider when considering joining a multi-level marketing plan to assist you in determining if it is legit or not. These tips are really broad and in some cases may deter you from joining a legitimate company, but the position of the FTC in offering these tips to the public is that it is much better to be safe than sorry. I add an eighth tip at the end that I feel is far more important than the other seven. Avoid any program that includes commissions for the recruitment of others. 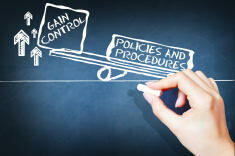 If a plan offers such a commission, it is against the law in all states. Avoid programs that pressure new distributors to purchase large quantities of inventory or small amounts of very expensive inventory. Avoid programs that boast that you do not personally need to make any retail sales to make money, merely that you will make your fortune through the work of your downline. because he said it does not make it true. Watch out for paid performers that will give you stories of their successes. Do not sign any contracts or give any money to the promoters at any business opportunity meeting or other high pressure meeting. Ask a friend or a lawyer if you are not sure. Do not rush into it. Make a list of questions you might have and get the answers before signing on the dotted line. Check the company out. Ask around. I consider suggestion number six to be the most important of all of the suggested tips of the FTC. Take your time. My philosophy is that if it is a good deal today, it will be a good deal tomorrow. And now for my eighth tip, which I consider to be of importance far above all the others and of importance in dealing with the other seven. Use common sense! There is no substitute for a little bit of old fashioned-look before you leap-common sense. Take your time and find a deal that is suited for your needs and interests. Do not jump into a deal with promises of no work and great fortune. Remember the old adage, if it looks too good to be true, it probably is! So what do you as a company do to keep yourself from obtaining the label “pyramid”? First, do not pay any commissions for the recruitment of individuals into the program. It is acceptable to charge a one-time at cost distributorship fee, but it is not acceptable to pay any commission on this fee. This fee can be used for some type of packet explaining company procedures, sales aides, or other training materials. Generally, the lower this fee the less scrutiny which you will be under from regulatory officials. Second, require that your distributors make retail sales in order to earn commissions. This is a key element used by regulators in distinguishing between a legitimate MLM and an illegal pyramid. Retail sales do not include items sold to others within the program or to others as a means of inciting them to participate in the program. It is also arguable as to whether or not sales made for personal consumption may apply as qualifying sales. The case law seems split on this issue, with the recent trend towards stating that a small amount of personal consumption sales may apply, but anything beyond what the jurisdiction considers reasonable will not apply. The rule established in the Amway litigation and with subsequent modifications since is that a distributor must do approximately five (5) separate retail sales monthly to persons outside of the distributor base in order to qualify for commissions or bonuses. Depending on the product and the cost there have been and will continue to be exceptions to this rule in the number of retail sales required, but there is little chance of ever surviving scrutiny with no retail sales. Remember that sales to existing distributors or sales made to persons becoming distributors at the time of purchase do not qualify for retail sales. Next, establish a 70% rule, meaning that no distributor may purchase additional products unless they attest that they have sold at least 70% of all products previously purchased. This helps in several ways, it avoids refund requests from persons with garages full of products, and it shows regulators that retail sales are being made by the distributors and that the company is acting responsibly not to overload distributors with inventory. It may be a good idea to voluntarily set up a program in which the company randomly verifies the information contained in the distributors 70% attestations. Perhaps a random sampling of 1% of all reorder forms each month. This is a good idea because in case of any investigation, the company will be able to show the investigator that the company has indeed not only implemented programs to insure that distributors are not “stocking up” on products merely to obtain commissions, but also that the company has implemented procedures to insure that the information obtained from Distributors is correct. This small step will go a long way towards keeping your company out of trouble. Many cases have been settled by either judgment or consent decree by the companies that have included a requirement that the 70% rule be followed and randomly verified by the company; take the initiative and make your company a good example by verifying information before you are forced too. It may prevent you from ever getting into a position of being forced to. Finally, one important rule that many companies fail to follow that ends up being their Achilles heal. Do not disguise a recruitment fee as a product sale. What does this mean? It is really quite simple, do not have an overpriced useless item that you sell to a person and in turn they become a distributor of your products, and on the sale of that item commissions are paid to the upline distributor. [Illustration 4] This is nothing more than a scam to disguise a sham, you know it, I know it, and you had better believe that the Attorney Generals know it. A recruitment fee is a recruitment fee and attempts to hide it will only end up getting you in more trouble. If your company ideal can not survive on the strength of the products, and needs the extra boost from recruitment income, perhaps now would be a good time to rethink your entire plan. The key is be real: real products, sold by real distributors, to real consumers. Those three ingredients will keep you out of real trouble.